The world can be a dangerous place. You never know what’s in store for you any time you walk out of your front door. 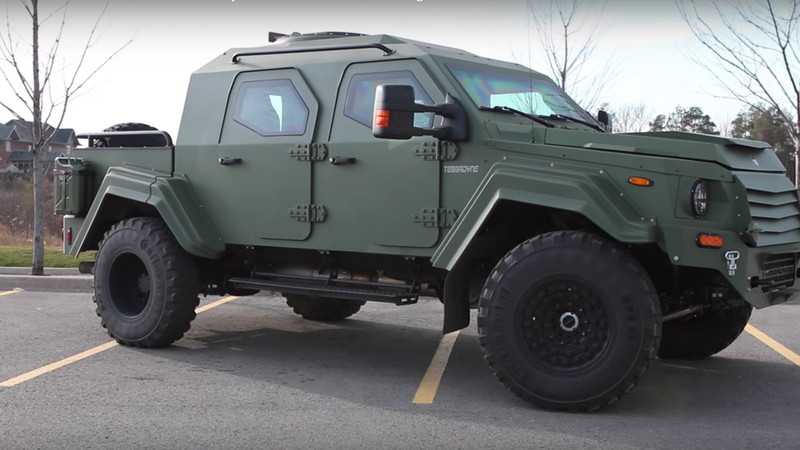 Terradyne Armored Vehicles understands that concern, so they started producing the Gurkha to make sure that you’re ready for battle as you go pick up your groceries. Since 2011, Terradyne has only offered the Gurkha. It’s their specialty. They offer four different configurations for all of your various pseudo-military needs. You can grab the LAPV (a light armored patrol vehicle), an MPV (a multi-purpose patrol vehicle), an RPV (a rapid patrol vehicle), and an RPV CE (a rapid patrol vehicle, civilian edition). I’m not sure if it’s shocking that the company is based in Ontario, Canada—but that’s where their cars are assembled. They’re all based on a Ford F-550 heavy duty truck chassis paired with a 6.7-liter turbodiesel V8 engine. They don’t tweak anything, so the Gurkhas retain the six-speed automatic transmission. And before you wonder why not manual: these things are designed for potential end-of-the-world situations. You don’t want to be shifting gears when the apocalypse rolls in. According to Autotrader, these bad boys top out at about 81 mph, since they’re, y’know, a little heavy and not exactly designed for speed. The Terradyne site outlines the specs of the various cars, so the Gurkha can run anywhere up to 19,500 lbs, depending on the options you outfit it with. It’s pretty intense. It’s the most well-outfitted non-military vehicle you can buy as a regular Joe. If you’re preparing for doomsday, though, you’re gonna be down about $350k. It might be worth keeping in mind that you can find one of these being manufactured in Ontario, so you’ll know where to head when the world starts going downhill.